1. Weigh and portion all the ingredients. 2. Set up bain marie for your whisk, spatula and thermometer. 3. Prepare molds by spraying with vegetable oil. 4. Sift together the first amount of sugar and apple pectin together. 5. Bring Passion Fruit Concentrate to boil (or at 104 F degrees). 6. Add the sugar/pectin combo to Passion Fruit Concentrate; make sure whisk to incorporate; return to boil. 7. Add the 2nd amount of sugar and return to boil. 8. Add glucose and return to boil. 9. Keep heat at medium to medium/high level and continue to whisk until thermometer reached 223 F degrees. 10. Pull off heat and add tartaric acid. 11. Whisk vigorously and pour immediately into molds. 12. Give pate de fruit at least 8-10 minutes to set and cool. 13. Un-mold or cut into desired pieces. 14. Toss in sugar and serve. Method #5 through #11, you must continuously whisk to avoid puree from burning. Store pate de fruit in a tight sealed container away from heat; can be stored at room temperature. 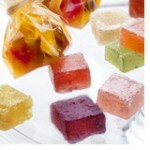 Shelf-life of pate de fruit is 2 weeks.